The Class of 1985 has awarded a total amount of $9000.00 in scholarship money over the past nine years. Please give yourselves a pat on the back for making this vision a reality. Your continued support in keeping this award alive is greatly appreciated. We are now accepting your tax-deductable contributions to The East Burke Class of 1985 Memorial Scholarship Fund. If you would like to make a donation through this website, you can do so by clicking on the Scholarship link. Simply scroll down to the bottom of the page and make your donation selection. You can make your donation by check card or credit card through our secure server when you check out. Any money received over the $1000.00 scholarship amount will be held in our class checking account to go towards future scholarship recipients. Thanks again for supporting the memorial scholarship. We are in the process of creating a plaque in honor and in memory of our fallen classmates to be placed in the school. The plaque will contain the names of our fallen classmates and the names of the annual award recipients. Applicants must be pursuing a post-secondary education. In addition, they must have a cumulative minimum 3.5 weighted grade point average, display consistent outstanding character, demonstrate a high level of serving others through community service and volunteerism, and have financial need. Application requirements include the completed application, an original essay, and a transcript. The Scholarship Selection Committee decided on $1000.00 as the amount for the EBHS Class of 1985 Memorial Scholarship fund. Any amount raised yearly over that amount will be kept in the class website scholarship fund and rolled over for future award recipients. Congratulations to Gracie Aldridge who was awarded the East Burke Class of 1985 Memorial Scholarship. Gracie received the scholarship at the Senior Awards banquet on May 25, 2018. Gracie plans to attend Gardner-Webb University. Congratulations to Zoey Ralston who was awarded the East Burke Class of 1985 Memorial Scholarship. Zoey received the scholarship at the Senior Awards banquet on May 26, 2017. Zoey plans to attend the University of North Carolina - Wilmington. Congratulations to Kalie Nicole Chambers, the 2016 recipient of the East Burke Class of 1985 Memorial Scholarship. Kalie it the daughter of Ms. Kelly Keener. The Class of 1985 was represented by Tina Stillwell Lowman in awarding the scholarship to Kalie at Senior Awards night, May 24. Kalie will be attending Warren Willson College in Swannanoa to major in sociology. 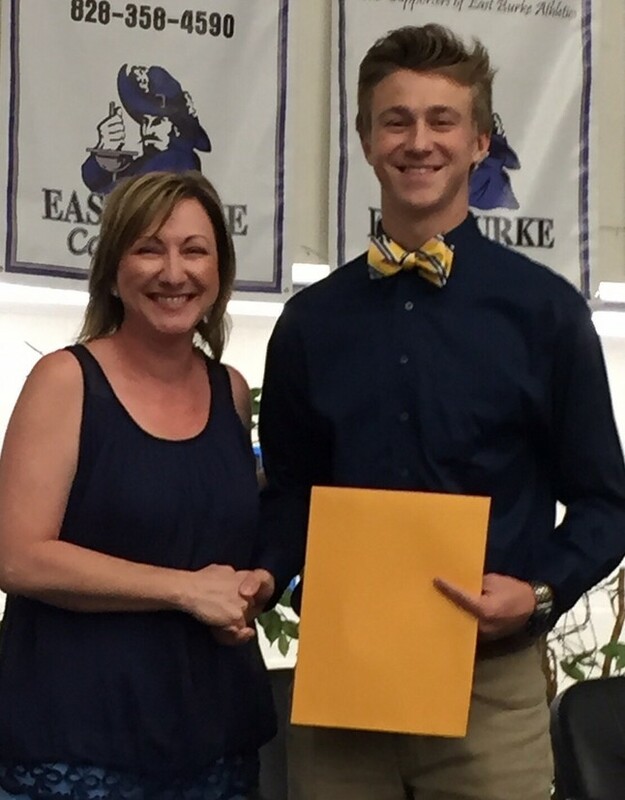 Congratulations to Jacob Andrew Leonhardt, the 2015 recipient of the East Burke Class of 1985 Memorial Scholarship. The Class of 1985 was represented by Tina Stillwell Lowman in awarding the scholarship to Jacob at Senior Awards night, May 26. In the fall, Jacob will begin his college education at Lenoir Rhyne University, where he will major in Graphic Arts. A message to the class from Jacob's mom, Kelly: Please share our gratitude with your classmates. It is such an honor and privilege that they chose Jacob for this award. 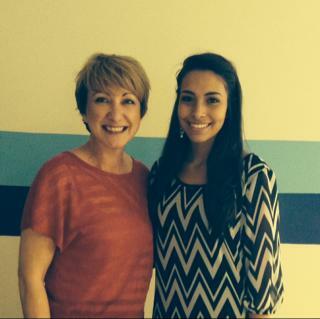 Congratulations to Rosalina Sanchez , recipient of the 5th annual $1,000 East Burke Class of 1985 Memorial Scholarship. Rosalina was awarded the scholarship by former classmate Tina Stillwell Lowman on behalf of the East Burke Class of 1985 and it's fallen members at the East Burke High School Awards Ceremony held in late May, 2014. Rosalina will be attending ASU in Boone, NC the fall 2014. Congratulations to Courtney Cheyenne Detter , recipient of the 4th annual $1,000 East Burke Class of 1985 Memorial Scholarship. Courtney was awarded the scholarship by former classmate Tina Stillwell Lowman on behalf of the East Burke Class of 1985 and it's fallen members at the East Burke High School Awards Ceremony held on May 23, 2013. 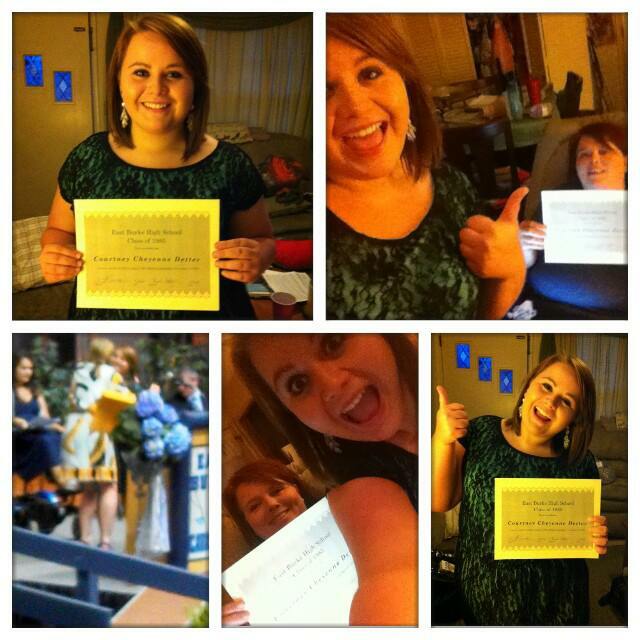 Courtney will be attending WPCC in the fall 2013. 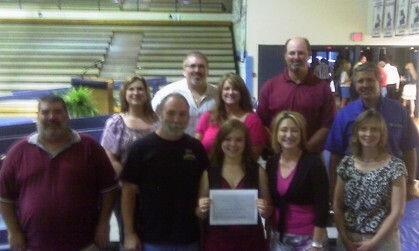 Congratulations to Layla Tallent, recipient of the 3rd annual $1,000 East Burke Class of 1985 Memorial Scholarship. Layla was awarded the scholarship by former classmate Tina Miller on behalf of the East Burke Class of 1985 and it's fallen members at the East Burke High School Awards Ceremony held on May 24, 2012. Layla will be attending CVCC in the fall 2012. Layla is shown proudly holding the award along side her dad to the left and surrounded by fellow EBHS Class of 1985 classmates. See if you can tell who is in the picture with Layla and her father. Congratulations to Hal Hudson, recipient of the 2nd annual $1,000 East Burke Class of 1985 Memorial Scholarship. Hal was awarded the scholarship by former classmate Tina Miller on behalf of the East Burke Class of 1985 and it's fallen members at the East Burke High School Awards Ceremony held on May 24, 2011. Hal will be attending NC State University in the fall of 2011. 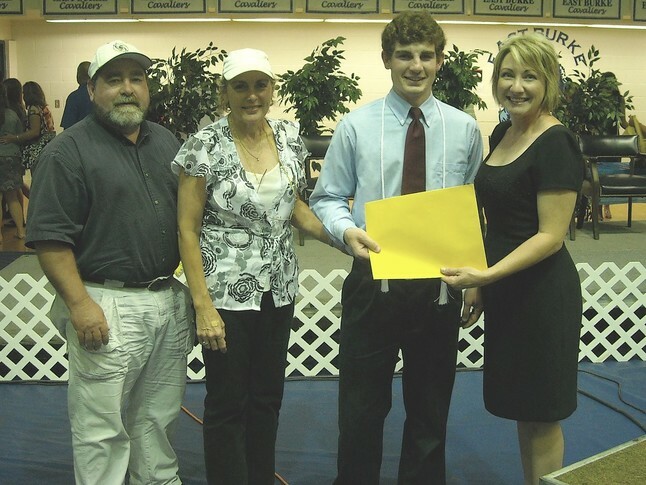 Hal poses with his Mother, Father and Tina Stillwell Miller after being awarded the 2011 East Burke Class of 1985 Memorial Scholarship. Congratulations to Brandon Ryan Phillips recipient of the 1st annual $1,000 East Burke Class of 1985 Memorial Scholarship. Brandon was awarded the scholarship by Tina Miller on behalf of the East Burke Class of 1985 and it's fallen members at the East Burke High School Awards Ceremony held on May 25, 2010. Brandon currently attends Western Carolina University, and majors in Music Education.